The last attempt resulted in a really unsatisfactory outcome, to say the least! This time, I took on a new approach. Instead of coating the brass tubes of a pen kit with dead fire ants, I decided to mix the fire ants with Alumilite resin and then pour the mixture into a Slimline mold. The nubs in the mold would leave an imprint on each of the pen blanks, which would provide a guide for drilling the 8mm holes required for the Slimline Pro brass tubes. Once the resin had cured, the casting was removed and the pen blanks separated and drilled. The blanks were equipped with Slimline Pro bushings and placed on the lathe pen mandrel. I turned the blanks without incident, using a carbide finishing tool. I then sanded the turned blanks up through 500 grit. After applying several coats of thick CA glue, the blanks were wet-sanded with micro mesh to 12000 grit, wiping the blank with a paper towel after each grit. A plastic polish was used to finish up the blanks. The final outcome was a very smooth, somewhat glossy surface. There were some white blushes on the surface which were probably due to areas in the casting where the fire ants may have separated from the mixture. Fire ants do float! (see our first fire ant pen blog) Also since the casting had fire ants mixed throughout, when the blanks were turned any ants near the surface would be sheared off, leaving a surface etched with small shavings of the ant bodies. I hope my fire ant research friend can see more detail under the microscope! 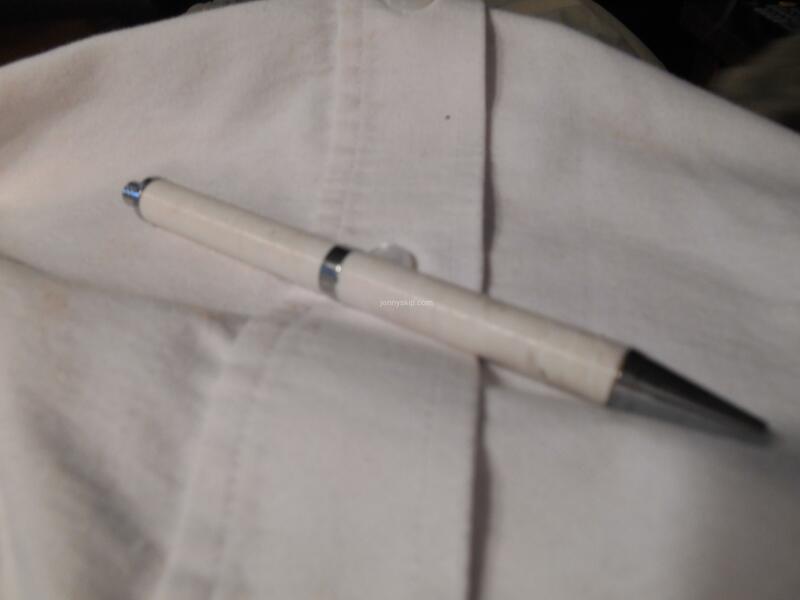 In conclusion, this method provided a more conventional method of turning a pen blank. There were no blowouts and a relatively smooth and finish-friendly surface. I’m just not sure anyone can tell that there are about 1000 fire ants in there! After our last blog and YouTube video on a fire ant pen build , a follower of ours from Australia asked if we could make a fire ant pen for her. This was several months ago, and we have just gotten around to finding the time to try this pen build again. I had forgotten how I successfully completed this project last time. Since it took me two tries before, I was hoping I could get it right the first time, this time! I took the brass tubes from a slim line pen kit and coated them with thick CA glue before rolling them in a pile of dead fire ants. After coating the tubes with fire ants, I placed the tubes in a 7mm pen blank mold. Using Alumilite resin, I covered the brass tubes and fire ants using the 7mm silicon pen blank mold. After the resin cured, I removed the pen blanks, and squared off the ends with a disk sander. The blanks were placed on a pen mandrel set in a minilathe. Using a carbide turning tool, the blanks were turned down to the bushings for the Slimline pen kit. The blanks were then sanded through the grits to 500 grit sandpaper. The sanding was followed by several applications of thin CA glue. Following the CA glue application, the blanks were wet-sanded with microbes to 12000 grit. The pen kit was assembled using a pen press. I sat back and took stock of the final product….. it was dog ugly!! (I can say this since I have cats). I’m not just saying this because it is made of fire ants..it really is ugly. The Alumilite didn’t cure properly, probably because there must have been some moisture in the fire ants. I’m not sure that is the reason, since the fire ants were cleaned with ether and dried. Besides the white streaks, several pieces of the Alumilte and fire ants broke off the brass tubes while turning. I tried to patch the voids with thick CA glue mixed with the turnings, but with little success. The final cylinders left the lathe, looking lumpy and ugly. So what have I learned? Probably to never try this again! But I will. Next time I’ll paint the brass tubes black before adding the fire ants. I’ll saturate each layer of the fire ant applications with thin CA glue. I might also use sandpaper to finalize the shaping of the blanks after a rough turning with a skew. Hopefully this will reduce chip-out during the shaping. Watch out for a follow-up blog/video on another fire ant build. This pen will not find its way to Australia! 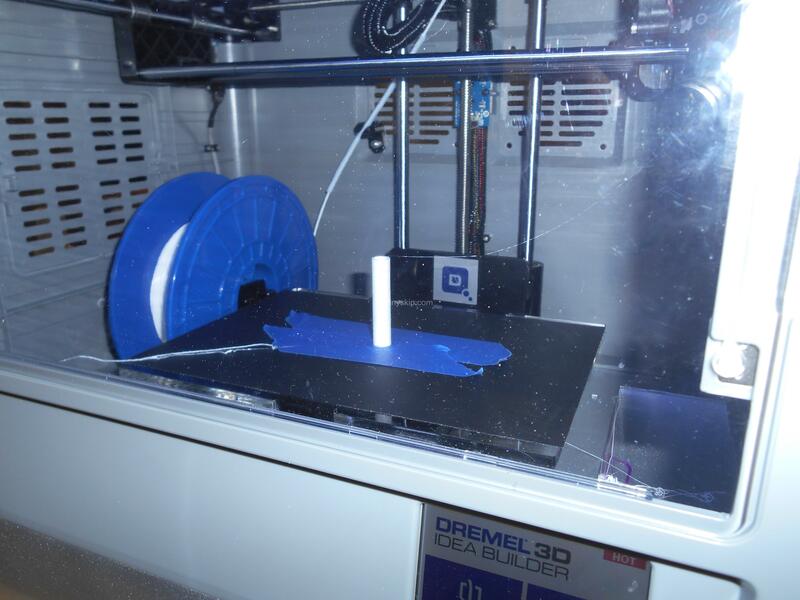 If you saw our previous YouTube/blog on my 3-D printer attempt to make a pen blank, you know it was a complete failure. I had hoped to be able to produce a conventional-sized pen blank and then turn this blank into a unique shape. I had used a variety of tool types but with no success. I also found that trying sandpaper was not a good idea in that the friction heated up the plastic to the melting point. Several viewers suggested printing up various other types of blanks, so I decided to try printing a cylinder to match the required barrel size for a pen. 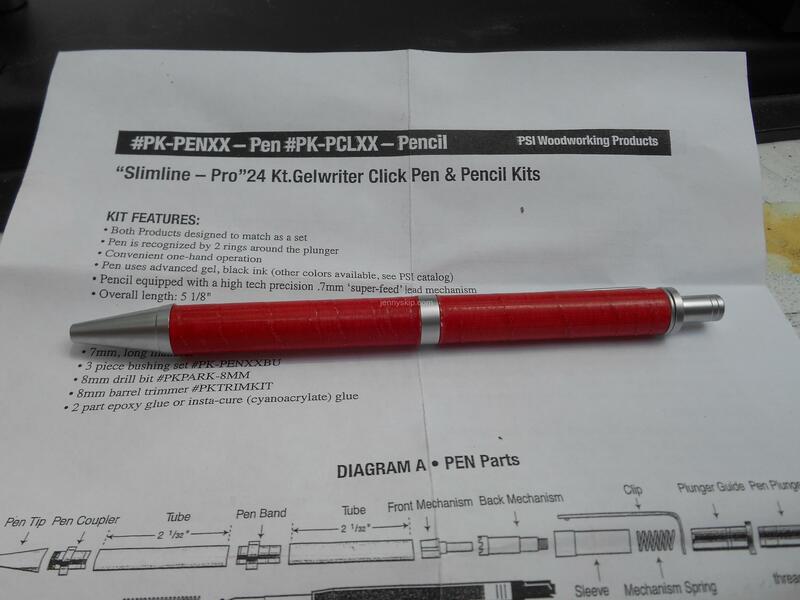 The pen kit I selected was a PSI Woodworking Products #PK-PENXX “Slimline – Pro” Gelwriter Click Pen. I also used a #PK-PENXXBU 3 piece bushing set. The two barrels for this pen are each 2 1/32-inch long with an 8mm hole for the brass tube insertion. The outside diameter of the bushings is about 10.7 mm. This would set the turn down diameter for the ends of the pen barrels. Using the 123Design software supplied with the Dremel 3D printer, I designed a 10.7 mm diameter cylinder 2 1/32-inches long with a 8mm diameter hole. 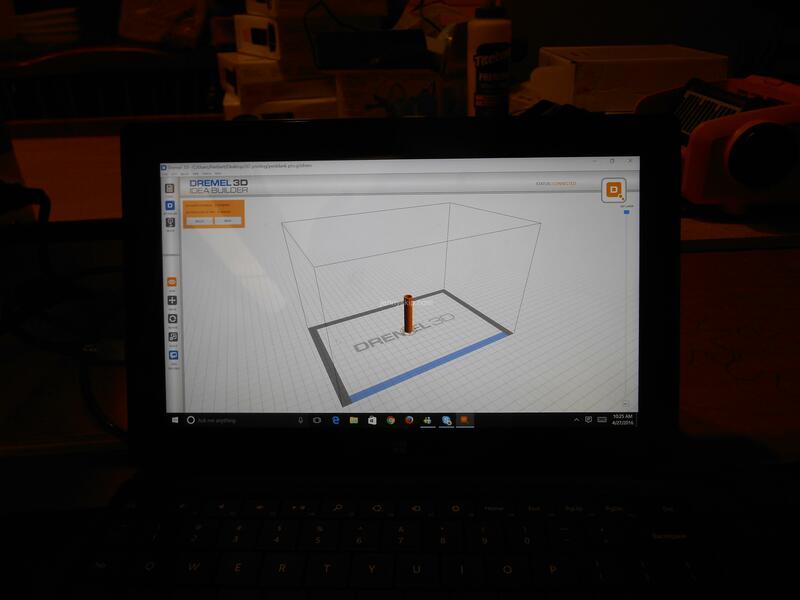 I exported this to the Drexel 3D printing software. Using the white filament, I printed one set of pen barrels. The 8mm holes appeared to be too tight to insert the brass tubes so I decided to take an 8mm drill bit and ream out the holes to the proper size, BAD IDEA!! The friction of the bit generated enough heat to reduce the barrels to a white plastic blob hanging off the drill pit. So I took a set of barrels and tried to press-fit the brass tubes. It worked!! And the fit was so tight that glue was not necessary. 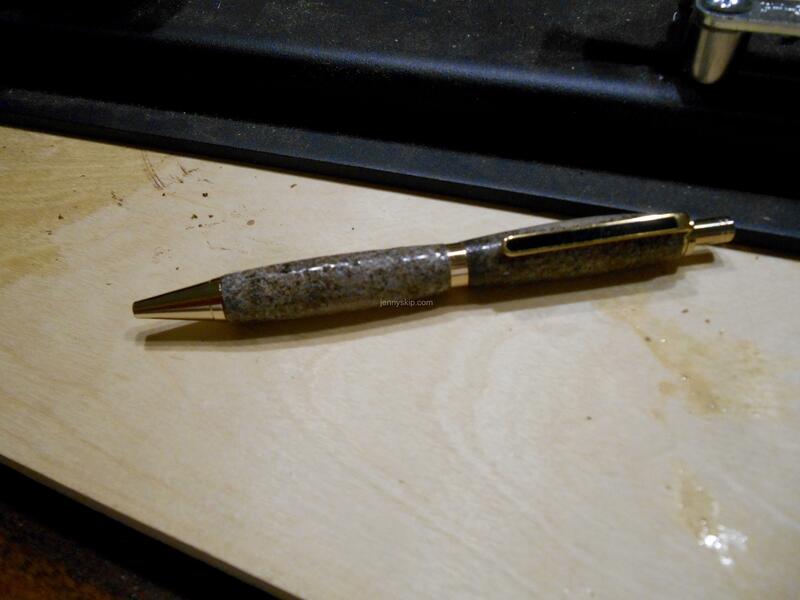 Using two barrels with brass tubes inserted, I built up one of the “Slim-line Pro” pens. This was a test, so I made no attempt to apply a finish to the plastic. I would not recommend this otherwise. The texture of the plastic barrels is not mirror-smooth and would be easily stained under normal use. On to another pen build… taking two more barrels, I press-fitted a brass tube into each barrel. I then used the bushing set to mount the barrels on a pen turning mandrel and set the mandrel into the head stock and tail stock on my lathe. Using Tulip Red Gilders Paste Wax, I applied two coats of wax, wiping off the excess and buffing after each coat. Following this step, I applied nine applications of thin CA glue. After this glue cured, I took Micro-mesh wet-sanding pads and sanded the CA finish from 600 to 12000 grit. I followed this up with a plastic polish. The final pen build is satisfactory but the surface of the barrels has a slight ripple that can’t be covered over with thick CA glue. In the future, I may try some different colored filaments. I have also air brushed 3D builds with some success. An air-brushed design protected with CA glue might be a good option. More on this later.